The best place to eat one is on the streets of Ho Chi Minh City, Fodor’s Travel recommends. 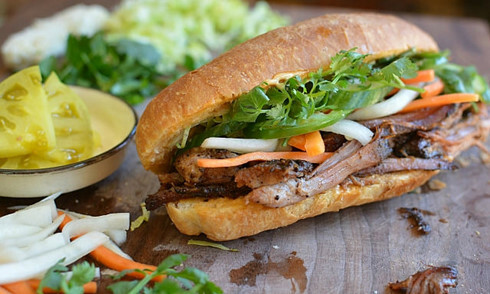 Vietnamese popular banh mi has been listed in the top of 20 street foods that one must try around the world, as recommended by the world’s largest travel site Fodor’s Travel. As a product of French colonialism in Southeast Asia, banh mi has become one of the favorite foods in Vietnam, to locals and tourists alike. It is a piece of baguette with various fillings. Standard stuffings include meat, which can be grilled pork, meatballs, or cold cuts, cucumber slices, cilantro, pickled carrots, liver pâté, and a swipe of mayonnaise. According to Fodor’s, banh mi has become increasingly popular and easy to find in many countries, but the best place to eat one is still on the streets of Saigon. The list of 20 must-try street foods goes round the world from crêpe in Paris to egg waffle in Hong Kong. “In many countries around the world, if you’re skipping what’s being served on the street, then you’re missing out on more than just a quick, cheap lunch,” it said.